Add a pinch of salt to 1 cup of maida. Mix well in a large bowl. Add sufficient water and make a smooth dough. Cover and leave it for at least 15 min. 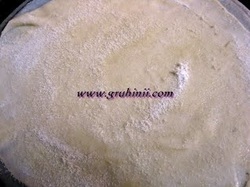 Now divide the dough into equal parts and roll them to thin rotis. You can see in the pic above. Now place another roti over it and repeat the same procedure. 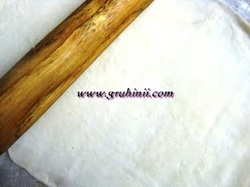 Place around 3 rotis in the same manner and roll the rotis together as shown in the pic above. Now cut the roll to equal portions with a knife. Slightly roll each piece with the roller as shown above. Prepare all the kajas in the same manner. Heat oil for deep fry. Fry the kajas in a medium flame until they turn to golden color. Remove from the oil and place them on a absorbent paper.